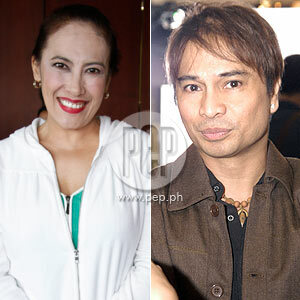 On November 30, the guest celebrities of You & Me Against The World are Ai-Ai Delas Alas (left) and Arnel Ignacio (right). Gretchen Barretto's game show airs on TV5 every Sunday at 7 p.m.
A former game show host will have a role reversal while a comedienne will show her serious side in the upcoming episode of You & Me Against The World. Find out if GoBingo host Arnel Ignacio and Ang Tanging Ina Ninyong Lahat star Ai-ai Delas Alas will get to take home the big prize versus the entertainment press on the show's second celebrity primer episode this Sunday, November 30. Hosted by Gretchen Barretto, TV5's You & Me Against The World provides viewers the opportunity to win fabulous prizes by registering through text as either a studio contestant or a home partner. Every week, 50 studio contestants and one home partner will be chosen from the pool of registrants. The 50 contestants will comprise "the World," and will be asked a trivia question to filter out two participants who will play "You" and "Me" contestants. "You" and "Me" will then play with and against the "World." There are three easy steps to join. Interested contestants must register and text in "WREG Name/Address/Age" (e.g. WREG Yoanna Garcia/10 Acacia St, Legazpi Village, Makati/21) to 2910 and download picture messages to qualify as either a studio contestant or a home partner. When prompted, registrants should key in "S1" up to "S50" to become a studio contestant, or "H1" up to "H50" to register as a home partner. For questions, texters may key in "HELP World." Entries may be sent to 2910 for Smart and Globe subscribers. Registration is free and can be done through a unique mobile number only once during the promo period. However, more frequent picture message downloads mean more chances of being selected to be either one of the 50 studio contestants or a home partner. Promo will run until February 10, 2009, with DTI permit number 5595. Watch and join You & Me Against The World to get a chance to win up to P1 million and lots of extravagant prizes from Gretchen, airing every Sunday at 7 p.m. on TV5.